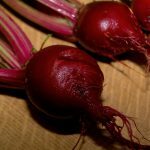 Raw beetroot is full of goodness. 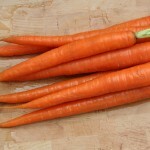 It contains potassium, magnesium and iron as well as vitamins A, B6 and C, and folic acid. Pretty impressive, isn’t it? Unfortunately, as I’ve already mentioned, it’s not that tasty as a juice unless you combine it with other fruit or vegetables. Depending on what you have in the cupboard you might end up being a bit limited in your options. In my case I’ve run out of several items that I’d normally have, so tomorrow’s juice will be a mix of beetroot, carrot and orange. Top and tail the beetroot and carrot. 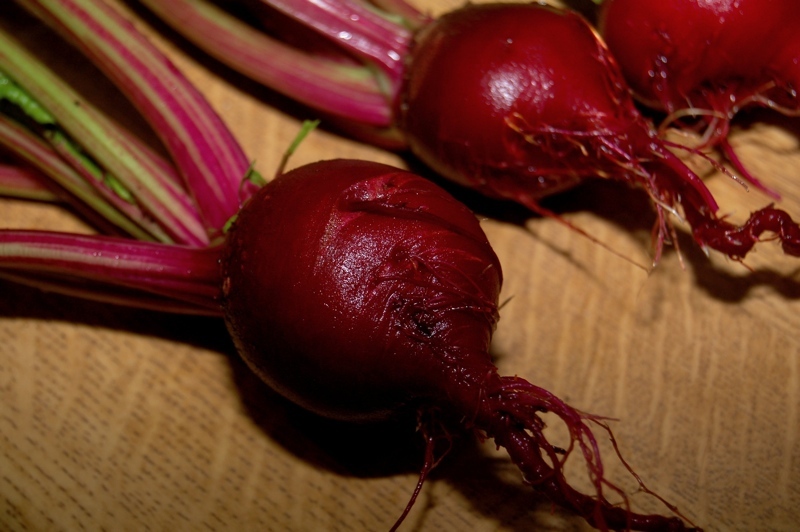 Beetroot is a fantastic vegetable, though you usually find it already cooked or pickled. 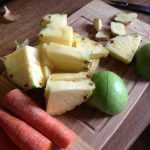 Making juice from beetroot was a whole new adventure in juice for me, so finding the right combination of juices was key. I ended up adapting this recipe to suit me ie. smaller quantity and different proportions. 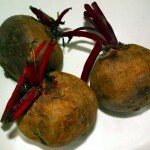 The end result is quite tasty, though it retains the deep dark red colour from the beetroot. The blender I’d ordered last week arrived a couple of days ago, so I had to get more fruit and vegetables to “feed” it. Unfortunately getting some of the fruit and vegetables that Jason Vale & Co recommend wasn’t possible in my local Dunnes Stores, but I was able to get some new ingredients to experiment with. 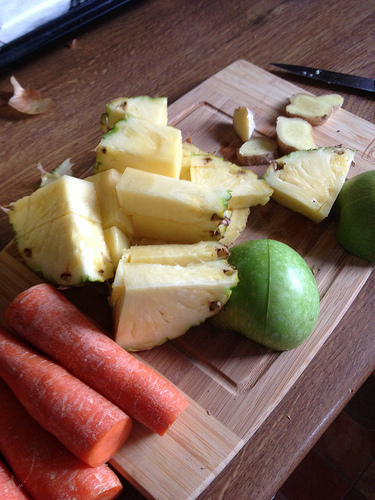 So over the last couple of days I’ve been making juices with fresh ginger root. The recipe below is what I had for breakfast this morning. Compared to a lot of the juices I’ve been having over the last couple of weeks it’s a lot lighter and sweeter. While it’s incredibly tasty it might be a bit too light for a full breakfast, so I’d probably consider it as more of a “snack” or something to drink with other food. A very fruity and refreshing juice. 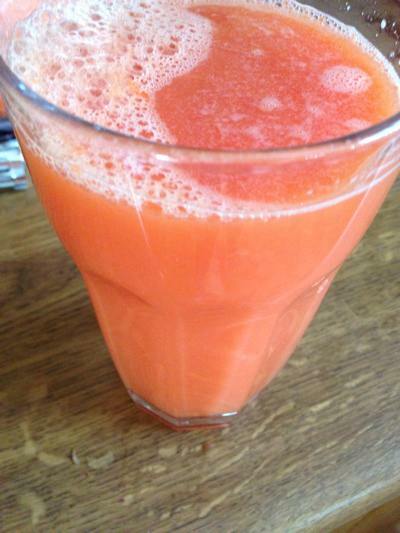 The ginger gives it a "zing"
The colour and taste of this juice is fantastic! 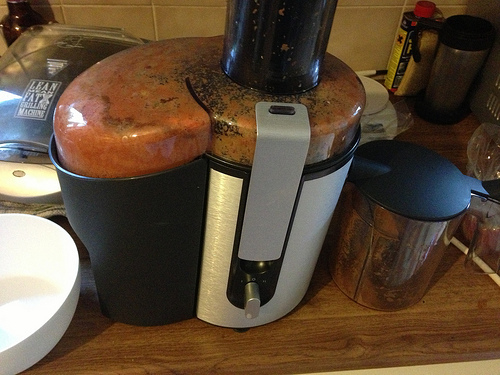 This morning’s juice was yet another variation and experiment. 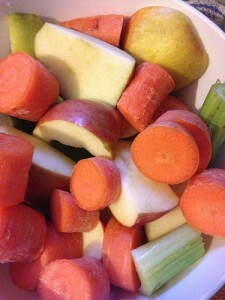 I made a very tasty fresh juice from apples, cucumber, carrots and celery. I won’t post a recipe this time, as the quantities this morning were a bit “off”, as I was running much lower on carrots and cucumber than I’d have liked. An annoying reality – carrots do not keep. I bought 3 bags of them on Saturday and they’re all gone now. The ones that are left aren’t usable for anything – they’ve got that shrivelled up thing going on as well as the horrible softness and odd discolouration. So again, this evening, I’ll have to go to a local supermarket to stock up on vegetables and fruit to feed the beast ie. 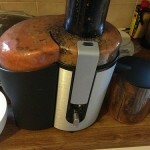 the juicer. I’m also going to break out my Jason Vale recipe books. Like other things they’ve been gathering dust since shortly after I got them! At the moment I’m trying different fruit and vegetable combinations that use fruit and vegetables that I can get easily. From what I recall, however, a lot of the recipes from the likes of Jason Vale also include quite a few combinations and ingredients that aren’t that easy to get in a provincial Irish town. Apple and carrot juice is very tasty, but a lot of people use celery as well. So yesterday evening, on the way home from work, I grabbed some more apples as well as some celery in a local shop. This morning’s juice had an extra “bite” from the celery, but was still incredibly tasty. I’m not sure if this is the “winner” in terms of taste and combination of ingredients, but it’s very nice. 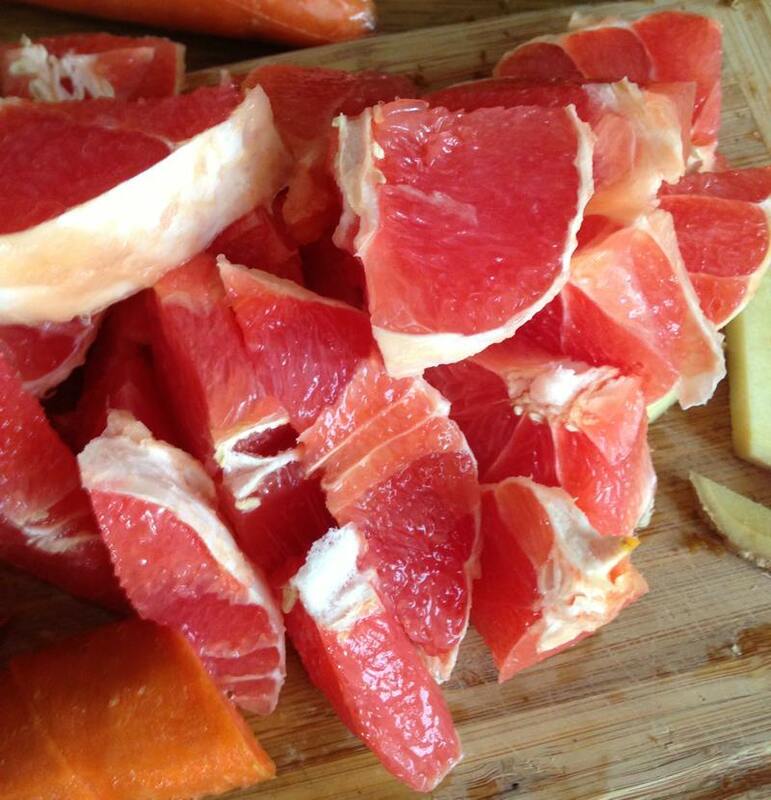 Enjoy a freshly made juice! 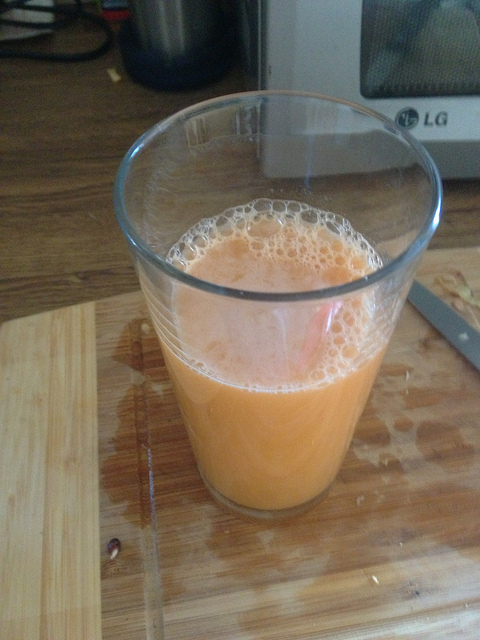 This morning’s freshly made juice – made with my own “fair” hands – was a mixture of apple and carrot juice. I didn’t have that many apples, but apples are much juicier than carrots, so it didn’t really matter. Core the apples and slice them up.